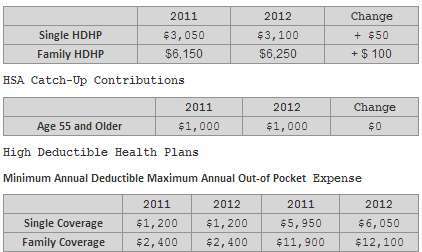 The HSA contribution limits for 2012 are slightly larger than the 2011 limits. The Treasury Department and Internal Revenue Service issued new guidance on the maximum contribution levels for Health Savings Accounts (HSAs) and out-of-pocket spending and deductible limits for High Deductible Health Plans (HDHPs) that must be used in conjunction with HSAs. The 2012 limits are set forth in Revenue Procedure 2011-32. In this revenue procedure, the IRS did not discuss whether the catch-up contribution amount of $1,000 changed. We have assumed it did not change for 2012. The IRS announces this change in May each year so that employers and individuals will have sufficient time to settle on HDHP insurance coverage and HSA contributions for 2012.